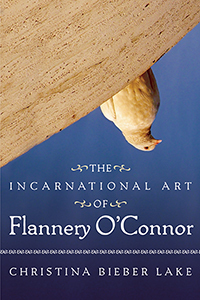 THE INCARNATIONAL ART OF FLANNERY O'CONNOR argues that O’Connor designed a unique asthetic to defy the Gnostic dualisms that characterize American intellectual and spiritual life. Focusing on stories with artist figures, objets d’art, child protagonists, and embodied images, Lake describes how O’Connor’s fiction actively resists romantic theories of the imagination and religious life by highlighting the epistemological necessity of the body. Ultimately O’Connor challenges the romantic and modern notion of the artist as a fire-stealing Prometheus and replaces it with a notion of the artist as a locally committed craftsman. Drawing upon M. M. Bakhtin’s early essays in ART AND ANSWERABILITY and TOWARD A PHILOSOPHY OF THE ACT, Lake illustrates O’Connor’s conviction that art deliberately assigns the highest value of transcendental beauty to those beings least valued by the modern world, and challenges us to do the same. The book culminates with an original reading of “Parker’s Back” that shows how in art, as in life, true knowledge comes to us through our own grotesque bodies and those of others. Unafraid of the mystery of being human, art can be the place where we encounter anew the world as more than what the intellect can unravel.